Kyoto is incredibly easy to explore by public transport (trains, subways, buses and taxis) or under your own steam (by bicycle or walking). This is a detailed guide to getting around Kyoto, with information on the best way to get to each part of the city. Kyoto has a world-class public transport system: the buses, trains and subways will get you where you want to go fast and efficiently. And, because the city is relatively compact and mostly flat, it’s also a great city for cycling and walking. Because the public transport system is so extensive, there are usually several ways to get to any particular destination, which is why it’s important to know the BEST way to get to where you’re going (see the Kyoto Transport by Destination Guide further down on this page). Kyoto is served by six train lines. While some of these are intended for intercity commuting, they all can be used to get around the city. For details on Kyoto’s train system, see the Kyoto Trains page. Kyoto has two subway lines that are the best way to move north-south and east-west in the city. For details on Kyoto’s subway system, see the Kyoto Subways page. You can download a free English-language PDF of the Kyoto train and subway system from the official JR Pass website (link opens PDF directly). See also my page of information about getting special Kyoto bus, train and subway ticket deals. Kyoto’s bus system is incredibly extensive: you can get almost anywhere by bus if you know where to board and which bus to board. However, most travelers find the train and subway systems to be faster and easier to use. For details on Kyoto buses, see the Kyoto Buses page. Taxis are plentiful and reasonably priced in Kyoto. And when you have three or four people, they can be a good value. They also allow you to cover a lot of ground fast and they can be used to connect areas that aren’t well served by public transport (for example, to go from Arashiyama to Kinkaku-ji Temple). 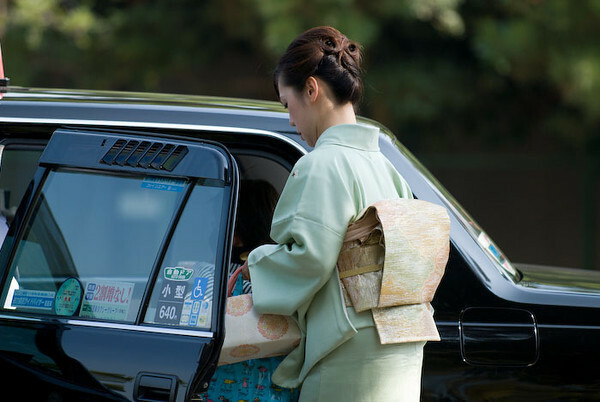 For details on Kyoto’s taxis, see the Kyoto Taxi page. Kyoto regularly appears on lists of the world’s best bicycle cities and for good reason: it’s a great place to explore by bicycle. It’s flat, the weather is usually good for cycling, and drivers are relatively sane. For details on exploring Kyoto by bicycle (including where to rent a cycle), see the Cycling in Kyoto page. Whether you want to amble around the sightseeing districts inside the city or hike in the hills that surround the town, Kyoto is a brilliant place to explore on foot. For details on walking in Kyoto, see the Kyoto Walking Itineraries page and the Best Kyoto Hikes page. 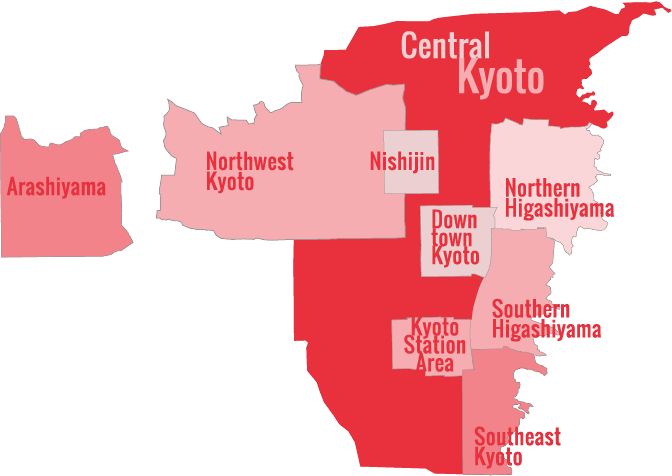 Kyoto is a compact city with a well-developed transport network. It’s very easy to get around. The subways and trains are the most convenient way to get around the city. Buses are less convenient, but cover almost the whole city. Taxis are plentiful and reasonably cheap. They’re sometimes cheaper than buses for groups of three or four on short trips. Bicycles are a great way to get around Kyoto. The city is mostly flat and the drivers are sane. If you enjoy cycling, I strongly recommend renting a bicycle to explore the city. Kyoto is a great city to explore on foot. Downtown area, Arashiyama and Higashiyama are all great for walking. There are several special tickets that will save you tons of money if you plan on riding the buses, subways and trains a lot. Avoid taxis and buses in the Higashiyama Area during the cherry blossom season. The roads will be so crowded that it will actually be faster to walk. Take trains and subways where possible – they’re faster and more comfortable than buses. Don’t be afraid to grab a map and just head out there. Kyoto is mostly a rectilinear grid pattern, so it’s easy to navigate. And, Kyotoites are unfailingly helpful when asked for directions. Here’s a list of the routes most often used by visitors to Kyoto, and the best form of transport to get from one specific place to another. Downtown Kyoto: Take the Karasuma Line subway to Shijo Station. Southern Higashiyama: Take the Karasuma Line subway, switch to the Tozai Line at Karasuma-Oike Station and get off at Higashiyama Station. Northern Higashiyama: Take the Karasuma Line subway, switch to the Tozai Line at Karasuma-Oike Station and get off at Keage Station. Daitoku-ji Temple: Take the Karasuma Line subway to Kitaoji Station and walk for about 10 minutes. Kinkaku-ji Temple: Take Kyoto City Bus No. 205 or 101 Kinkakuji-Michi. Ryoan-ji Temple: Take Kyoto City Bus No. 205 or 101 to Kinkakuji-Michi, then a brief taxi ride from there to Ryoan-ji Temple. Arashiyama: Take the JR Sagano Line to Saga-Arashiyama Station. Kurama and Kibune: Take Kyoto Bus No. 16 or 17 to Demachiyanagi (be careful to board a brown Kyoto Bus, not a green Kyoto City Bus) and switch to the Eizan Line and get off at Kibune or Kurama. Takao: Take a JR bus and get off at the Yamashiro Takao stop. Uji: Take the JR Nara Line and get off at Uji. Tofuku-ji Temple: Take the JR Nara Line to Tofukuji. Fushimi-Inari Taisha Shrine: Take the JR Uji Line to Inari. Nara: Take the JR Nara Line to Nara (if you have a JR Rail Pass) or take the more convenient and faster Kintetsu tokkyu (express) train to Nara. Osaka: Take a shinkansen to Shin-Osaka if you have a JR Rail Pass, or take a JR shinkaisoku (express) to Osaka if you don’t have a JR Rail Pass. Kobe: Take a shinkansen to Shin-Kobe if you have a JR Rail Pass, or take a JR shinkaisoku (express) to Sannomiya if you don’t have a JR Rail Pass. Hiroshima: Take a shinkansen to Hiroshima. Tokyo: Take a shinkansen (Nozomi or Hikari shinkansen). Kansai Airport: Take the JR Haruka Airport Express. Kyoto Station: Take the Karasuma Line subway from Karasuma-Oike or Shijo to the Kyoto stop. Southern Higashiyama: Take the Tozai Line subway from Karasuma-Oike, Kyotoshiyakusho-mae or Sanjo-Keihan to the Higashiyama stop. Northern Higashiyama: Take the Tozai Line subway from Karasuma-Oike, Kyotoshiyakusho-mae or Sanjo-Keihan to the Keage stop. Daitoku-ji Temple: Take the Karasuma Line subway to Kitaoji and walk for 10 minutes. Kinkaku-ji Temple: Take Kyoto City Bus No. 59 from Kawaramachi-Sanjo to Kinkakuji-Michi. Ryoan-ji Temple: Take Kyoto City Bus No. 59 from Kawaramachi-Sanjo to Kinkakuji-Michi and then take a brief taxi ride. Arashiyama: Take the Tozai Line subway to Uzumasa-Tenjingawa and then a brief taxi ride (if you’re in a hurry), or take Kyoto City Bus No. 11 from either Sanjo-Keihan or Shijo-Kawaramachi. Kurama and Kibune: Take the Keihan Line north to Demachiyanagi and switch to the Eizan Line to Kibune or Kurama. Uji: Take the Keihan Main Line south to Chushojima and switch to the Keihan Uji Line to Uji. Tofuku-ji Temple: Take the Keihan Main Line to Tofukuji. Fushimi-Inari-Taisha Shrine: Take the Keihan Main Line to Fushimi-Inari. Osaka: Take the Hankyu Line from Kawaramachi to Umeda, or the Keihan Line from Sanjo-Keihan or Gion-Shijo to Yodoyabashi.